We're all ensembleing for comfort when it comes to dressing up, and this combination of a red coat and a Miu Miu matelasse flap shouldercrossbody bag is a perfect example of that. Perk up your look with red leather loafers. We're all ensembleing for comfort when it comes to dressing up, and this combination of a blue floral short sleeve button down shirt and a Miu Miu matelasse flap shouldercrossbody bag is a great example of that. When it comes to shoes, this getup pairs really well with silver leather flat sandals. We all seek comfort when it comes to dressing up, and this combination of a navy crew-neck sweater and a Miu Miu matelasse flap shouldercrossbody bag is a perfect example of that. Bring instant interest and excitement to your look with tan leather pumps. We all seek comfort when it comes to dressing up, and this combination of a silver sweater dress and a Miu Miu matelasse flap shouldercrossbody bag is a wonderful example of that. Rocking a pair of navy embellished satin pumps is a simple way to add some flair to your look. If you're a fan of practicality dressing when it comes to your personal style, you'll love this stylish pairing of a black crew-neck sweater and a red quilted leather crossbody bag. Dress up this outfit with black elastic ankle boots. 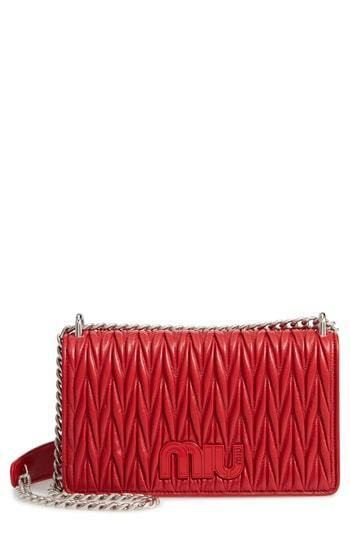 Consider pairing a red coat with a Miu Miu matelasse flap shouldercrossbody bag for a casual coffee run. We're all looking for comfort when it comes to dressing up, and this combination of a black sweater dress and a red quilted leather crossbody bag is a good illustration of that. You could perhaps get a little creative in the footwear department and elevate your ensemble with red velvet over the knee boots. 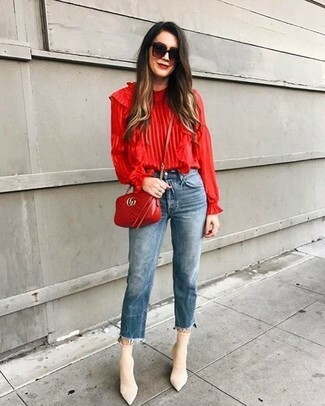 If you're all about relaxed dressing when it comes to your personal style, you'll love this cute combo of a red ruffle long sleeve blouse and a Miu Miu matelasse flap shouldercrossbody bag. Wearing a pair of beige elastic ankle boots is a simple way to add some flair to your outfit. If you're obsessed with practicality dressing when it comes to your personal style, you'll love this stylish pairing of a red floral cardigan and a Miu Miu matelasse flap shouldercrossbody bag from Nordstrom. To add oomph to your look, complete with red suede pumps.